To move away from pork-centric curing for a minute, I 've been working on my first batch of summer sausage. 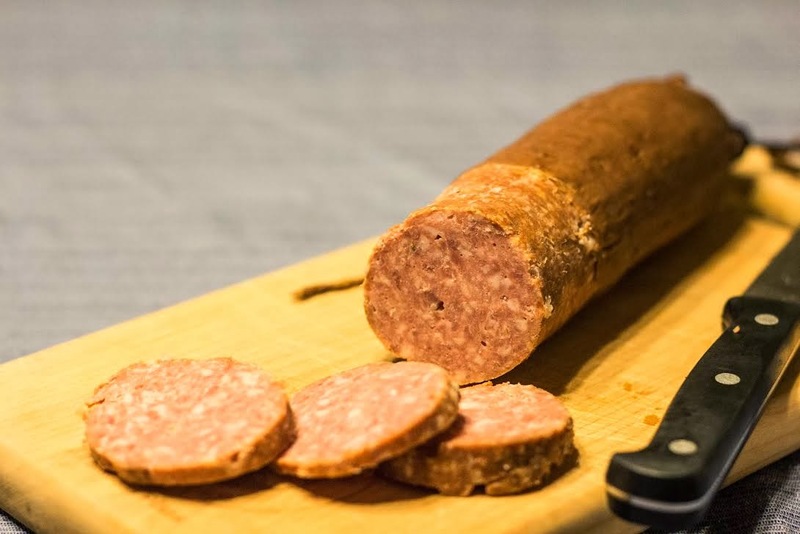 Although today the term "summer sausage" conjures up less than noble images of shopping mall kiosks selling shelf-stable cheese spreads and vac-packed meat of questionable origin during the holidays, it's actually a great product. 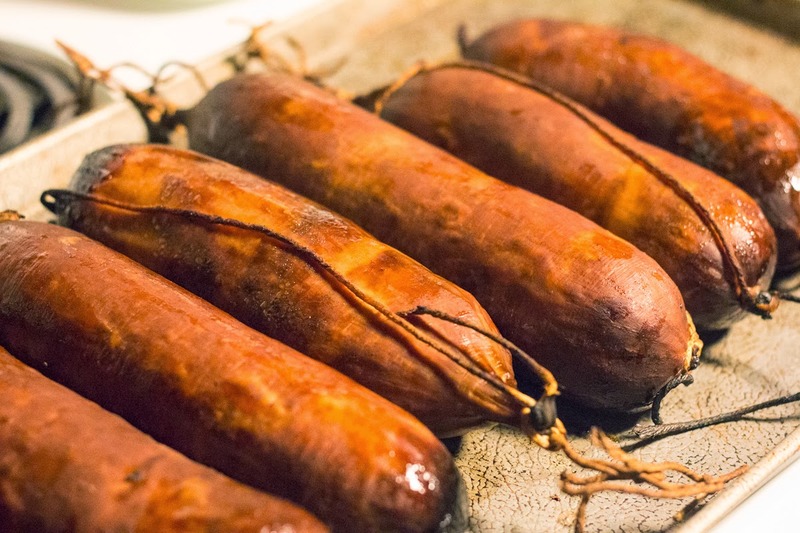 The name comes from the fact that this sausage could last through the hot summer weather without spoiling. There are all-pork versions out there, but I was curious to try a cured beef variety. While at Underground Meats I tried a summer sausage made with 50% beef hearts in the mix. This was an older recipe that the man had learned from his first job at a multi-generation meat plant, where the grandfather of the company would save the beef hearts for this recipe. This was my inspiration, but I had one problem: no heart. I thought I still had a heart, somewhere in the freezer, but it was clearly long gone. Regular readers of this blog will realize I'm being completely literal, not metaphorically poetic. Undeterred, I settled on a beef arm roast. This was ground and mixed with pork back fat, as pork fat is much more stable and resistant to oxidation and spoilage than beef fat. Then came the curing. 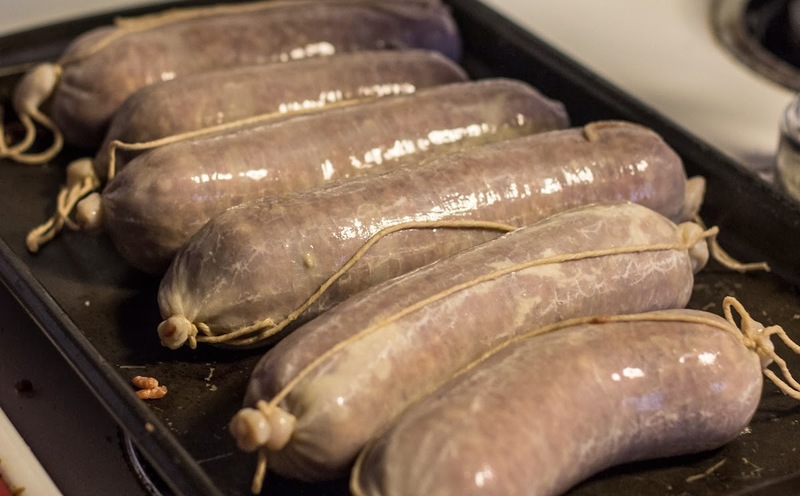 Summer sausage, like many other items, gets its extended shelf life from a high acidity (like vinegar, cheese, and pickles) as well as the smoking process (which lays down an outer coating of antimicrobial and antioxidant smoke). The curing was particularly interesting to me, as it was a new technique to learn. Summer sausage is not quite a fresh sausage, like bratwurst, or a fully cured sausage like salami. But it is fermented for 2-3 days, which helps raise the acid levels. 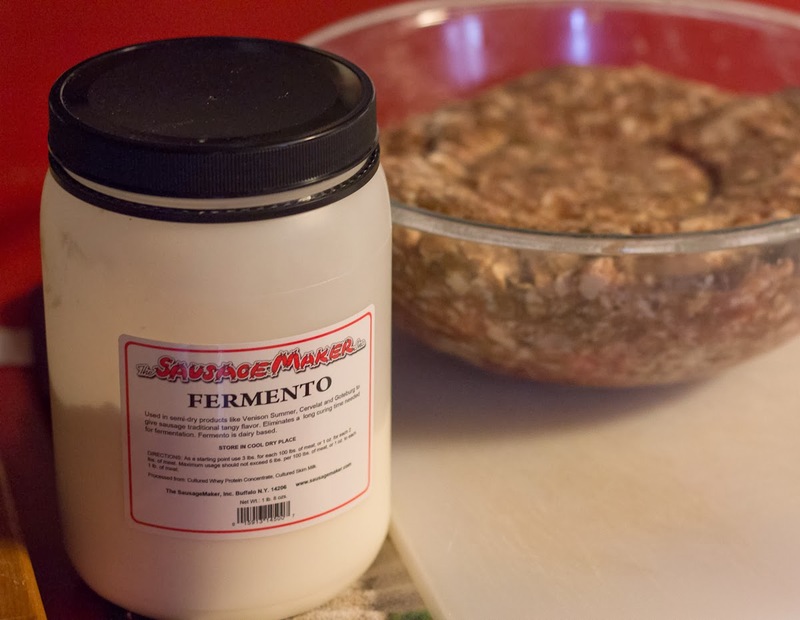 You can raise the acidity in two ways - use a meat curing culture, like FR-M-52, or use a product called Fermento. I've never used Fermento and was curious to try it. Fermento is a blend of cultured whey and skim milk, which seems like an easy way to get the lactic acid bacteria you would normally get from a living culture like FR-M-52, which is full of Lactobacillus bacteria. Plus, I've been reading about pickling vegetables with whey, so this seemed like an interesting alternative. Aside from the curing time in the fridge, the rest of the steps were pretty similar to my past smoked sausage recipes. While summer sausages are normally sealed in an artificial casing, I used beef middles, as that's what was on hand. It still gave me a 2-3" diameter on the finished product, and frankly I didn't find them hard to peel at all. I'll continue use them in the future, rather than make a special purchase of collagen casings. The stuffed sausages were then cold smoked for an hour with oak, before being hot smoked to 155 F internal temp. The total smoking time was about 5 hours, including the hour of cold smoking. I love the look of these fresh from the smoke! I imagine that this is what a summer sausage looked like in generations past. Peeling off the outer casing, I was pleased to see a rosy pink interior dotted with small bits of white fat. It's funny, but after ragging on the commercial summer sausage I was happy my finished sausage looked like a "professional" product. Two things I noticed, though, is that the sausage was not particularly strong and tangy, as some summer sausage. I actually preferred this, as it didn't taste too acidic. I wonder if I made this recipe again using FR-M-52 instead of Fermento that there would be a stronger bite. Secondly, the sausage sliced into nice, firm rounds, but it wasn't the particularly firm or chewy texture I've had with other products. Calling it "crumbly" isn't right, as it held together fine, but it just seemed to have a softer texture than I imagined. Perhaps I need to mix and knead the forcemeat for an longer time before stuffing it to get a stronger bind.